The beautiful town of Oia on the island of Santorini sits atop the cliff walls of the Santorini caldera, giving some of the most astounding views on the planet, day or night. This is the night view from the patio outside our hotel room in Oia in the very early morning hours in early June. 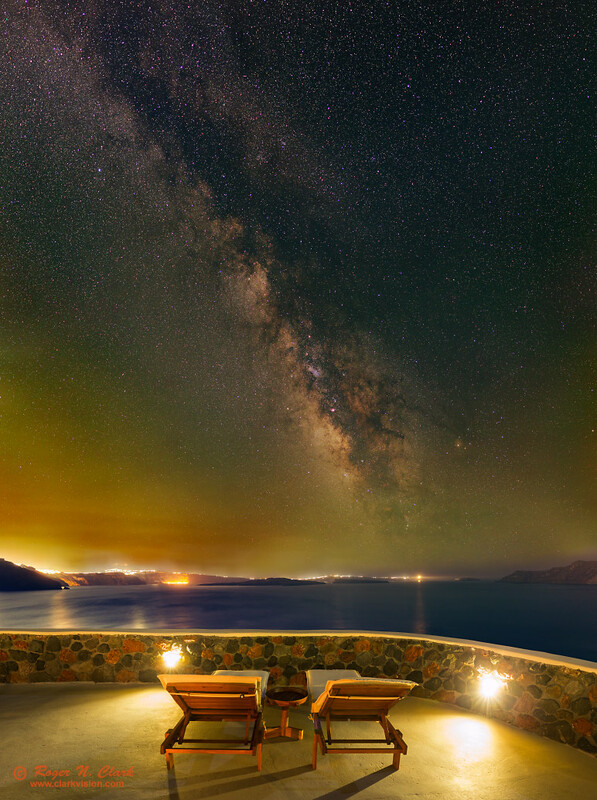 The view shows the Milky Way galaxy over the Santorini caldera. The far rim of the caldera are where the lights show. Near the left edge of the frame is the town of Thera. To the right of Thera and at the waters edge are the bright orange lights of the port where the ferries go. The green and red light in the night sky is from airglow, light from molecules in Earth's upper atmosphere excited by solar ultraviolet light during the day and from cosmic rays. The molecules emit light throughout the night. The red is typically from hydroxyl (OH) 80 to 90 km high, and the green is from oxygen around 95 km high. Low in the sky is some fog, which is illuminated by the city lights, coloring the clouds and fog orange, especially on the left side with the bright lights of Thera. For more on natural color in the night sky see Parts 2a, 2b, 2c and 2d on Color of the Night Sky and proper post processing to show those colors. The center of the Milky Way galaxy and the constellation of Sagittarius are the brightest part of the Milky Way, and the Constellation Cygnus is at the upper left corner of the scene. To the right of the center of the Milky Way galaxy is the constellation Scorpio with its bright orange star Antares. The haze around Antares is light scattered by dust near Antares. Visually, the glare of the city lights prevents dark adaption. I covered two patio lights and then, after dark adaption, I could nicely see the star clouds of the Milky Way. A pair of binoculars shows most of the objects recorded here. Technical. This image is a 54-frame mosaic. Canon 6D 20-megapixel digital camera, Sigma 35 mm f/1.4 DG HSM lens at f/1.4. Fifty-four exposures at ISO 1600 were made, each a 30 second exposure, except for 3 images of the lights on the far side of the caldera where 5-second exposures were combined with 30-second exposures to make a high dynamic range (HDR) composite. Exposure of the stars were tracked using an iOptron SkyTracker, while those for the land had the Ioptron star tracker turned off. Final image is 9274 pixels wide by 12412 pixels high, covering about 100 by 134 degrees. No dark frame subtraction, and no flat fields were used. The Canon 6D has the very low pattern noise, and on-sensor dark current suppression, so there is no need to do dark frames. Modern raw converters correct for hot pixels and, with lens profiles, correct for light fall-off, so there is no need for flat field corrections. Processing was done with 16-bits/channel.